Yup, I’m a terrible blogger. But I’m also in the middle of a busy con turnaround: Awesome Con this weekend, PAX East next weekend. So here’s a drive-by post. I’ll try and catch up on event recaps once I’m back from PAX. Yesterday started out pretty boring: finishing my taxes. Then I had to sew the last six inches or so of the second glove for my Bombshells Catwoman costume, which I was going to wear to Awesome Con that afternoon. I always try to finish my costumes with at least a day to spare before an event, in case something goes wrong. (It’s why I have no shame about re-wearing things; I just can’t handle that last minute stress in my life.) But this week I had to stay late at work every day, so there was only so much I could get done. Thankfully, I have sewn a lot of gloves before, meaning I knew how much time it should take. Therefore, even though I was sewing until half an hour before I had to get dressed, it wasn’t frenzied. I was pretty sure I had just the right amount of time, and that turned out to be true. Then I got dressed and we drove to Awesome Con. I got to the convention center at 1 PM, while Mike went to park the car. I knew Tom King, the current writer on the Batman comic, was signing until 2 PM, so I immediately went to the expo hall to see if I could get in line. When I first got to the signing area, I saw a huuuuuuuge line that snaked around two aisles. When I asked a person standing there whether it was the line for Tom King, they said they weren’t sure, but that they thought it was. (I think they were in line for Scott Snyder, and didn’t care whether it was also the line for someone else.) That line was capped, so I figured it wasn’t a big deal for me to investigate more to see if there was another line. I’m glad I did, because I then found a line that was only about a quarter as long that turned out to be the line for Tom King. I only had to wait maybe 20 minutes to get to the front of that line. As is somewhat common at comics signings (though becoming less and less so), I was one of the few women in the line, and the only woman that was there alone. Once I got near the front of the line, I could hear Tom King talking to the convention goers. He was asking each person what they did for a living. The person right in front of me was an Orioles beat writer for the Baltimore Sun, and he shared a behind-the-scenes war story about that. I figured I’d seem pretty lame compared to him, but King was very nice and talked to me about my job for a couple minutes. Then, as an unexpected bonus, not only did he sign my books, but the artist, Clay Mann, was also there and signed them too. Overall, it was a very pleasant interaction. It stinks when you meet a creator whose work you like, but they turn out to be a jerk. This was not the case here! After that, Mike and I went to take a few photos of my costume. 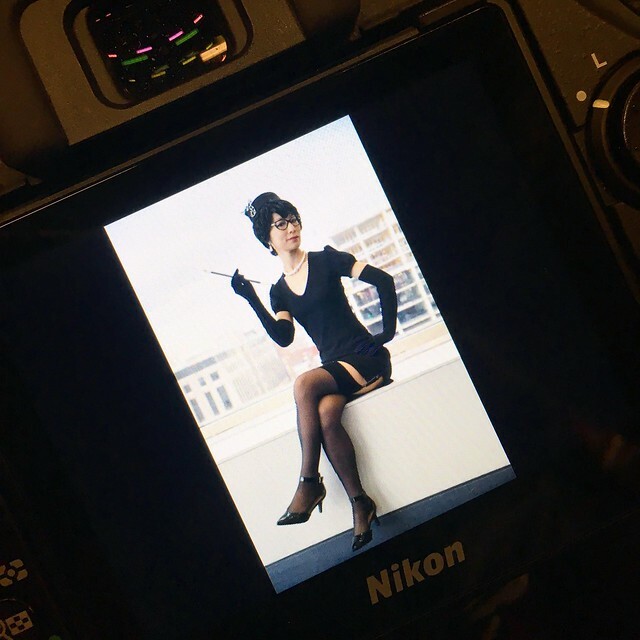 I will have full edits later, but here’s a back-of-camera teaser. I am so happy with how this cosplay came out! Then we went to a panel given by Paul Levitz, who is not only an accomplished comics writer (he created Huntress in the Batman universe, for example), but also was the head publisher (like the COO) of DC Comics until around 2009. He had a lot of thoughtful things to say about the comic book industry and how it has evolved over his 40-plus year career. (And he started in the industry when he was only in his teens! He’s just in his early 60s now.) It was particularly interesting to hear him talk about the transition from newsstand sales to the comic book shop and bookstore trade paperback markets. And he was very good at answering questions. One person had a paragraph-long question with many parts, and Levitz tried to carefully answer every part. When he got to saying “as for the fourth part of your question,” I was impressed. I would not have even remembered there was a fourth part! Again, it was great to see a creator whose work I like who also seemed to be a nice person. Then I did several photo shoots. First with Justin of Rich and Strange Photography, who was trying out his new Fuji mirrorless camera. I can already tell that he got some beautiful, dramatic shots. Then we met up with Jamey, who was debuting her Bombshells Black Canary. We shot with Mike for a bit upstairs, and then went downstairs to meet Dan for more photos near the expo hall. Dan was also nice enough to let Mike experiment with his external flash and softbox. I’m excited to see the photos that we got! We ended the day by watching the costume contest (where Amelia and Lena had an awesome choreographed fight sequence that took second place) and doing a little browsing of the vendors. Then I came home and collapsed. Tired, but happy with a good day!